Or kicking up a noise. I believe in a harmless joke. I banish care in Ireland. Where the flowery Praties grow. Music at HOEPOOD & CREW'S. Found something in her arms. there?" she said "Hush h-h-h !" Some said | What a splendid child!" Describe them no one can! As a very clever man. to feel thankful, Sir,'' I said" I do, I do, I do!" they all said " Hush-h-h-h! " On the day I married so was " Jones,"
I wonder, you or I?" Jones always thinks he's number one. And crack a bottle of wine! And see how nice he looks. have him weigh'd! so do come but mind. Where flowery praties grow - first line reads: Behold! a happy Irish gent. Don't make a noise or else you'll wake the baby - first line reads: If you perceive my bosom heave. Where flowery praties grow: Sung by Arthur Young the versatile Irish entertainer, with immense success throughout Great Britain and Ireland. 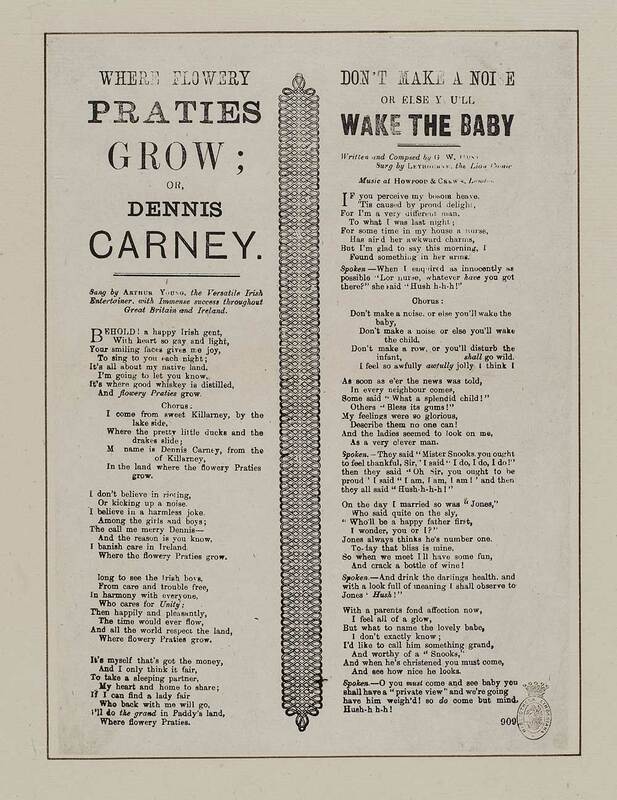 Don't make a noise or else you'll wake the baby: Written and composed by G. W. Hunt, sung by Leybourne the lion comic. Music at Howpood & Crew's, London.